It's been a while since I posted something related to our current layout. But last Thursday was a good occasion to make substantial progress in Villeneuve, including the ditches. 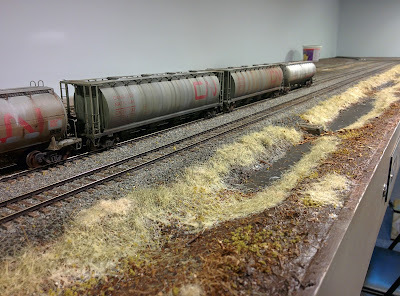 As you can clearly see, the ballasting process is nearing completion. 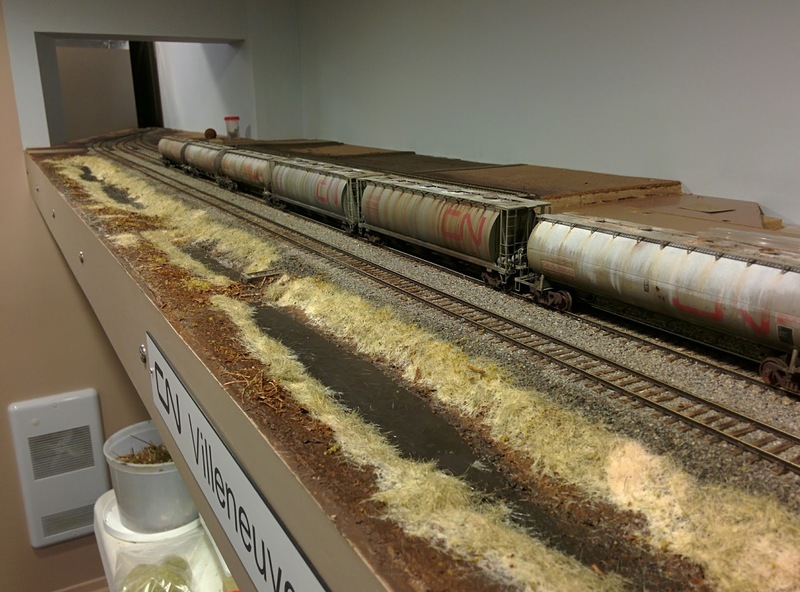 It really helps to blend the tracks onto the layout and make the yard much more impressive. I'm also quite satisfied with my homemade ballast. I think I finally found a recipe that works well for my prototype and that can be easily altered to fit a particular track, be it main line or siding. Work also resumed on scenery with a new wood retaining wall made out of stained matches. This spot will hold a relay box as per prototype. The still water in the ditches is simply MDF painted with dark brown and black paint blended on spot. Grass was put by hand directly on fresh paint and white glue. Nothing fancy, but once again, I was working with prototype pictures of Villeneuve shot in the mid-2000s in the right season. Before applying the grass, some vegetal debris, green scenery foam to represent small plants and other bulk material were sprinkled to give texture to the soil. Keep in mind this is only the first pass. Some small shrubs and more grass need to be added, however, I'll wait both grade crossings are done before the final touch. When I write too much about track planning and layout design, this is generally a good indicator I’m not working that much on the club layout. While this is not an optimal situation, it has at least the advantage to take a step back and assess the project as a whole and fine tune the approach. Also, working on other “what if” designs are not wasted time since practice makes perfect. For this reason, I never fear to tackle such challenge for the sake of honing my skills. And at the end of the day, this is extremely useful hobby time since what I learn from layout planning and model railroading can be used directly in my architecture practice. By the way, I still have one last design in the oven until I go back to our main subject. Such occasions also gave me time to revisit my Temiscouata project and fine tune some aspects in regard with era, operation, rolling stock, scenery and benchwork construction. I’m certainly taking my sweet time with this one, but I see no reason to rush things up. We are progressing at a slow pace on the club layout. Conflicting schedules and commitments are making it hard to gather together and work efficiently. It is certainly how I expected this autumn modelling season to be, but at least we aren’t stalled. 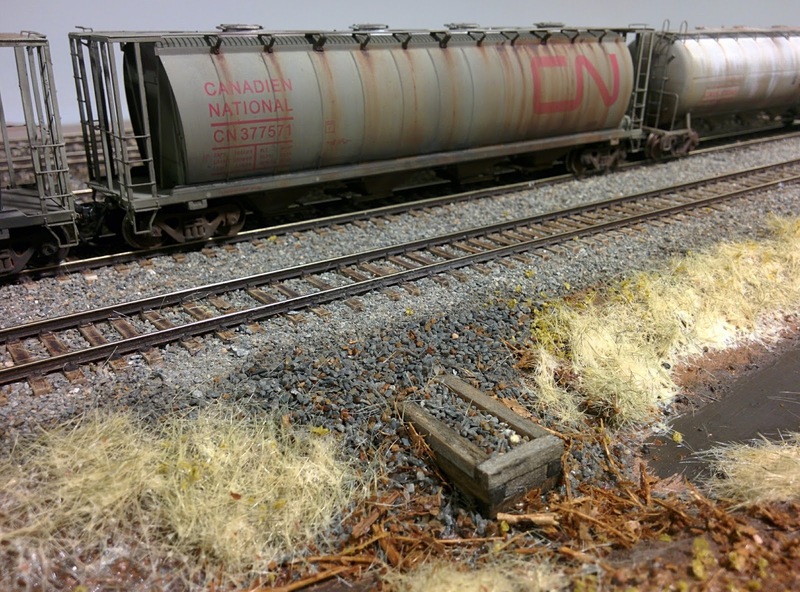 Villeneuve yard is now entirely ballasted and only two short sidings needs to be done at a later date when the cement plant will be definitely installed. 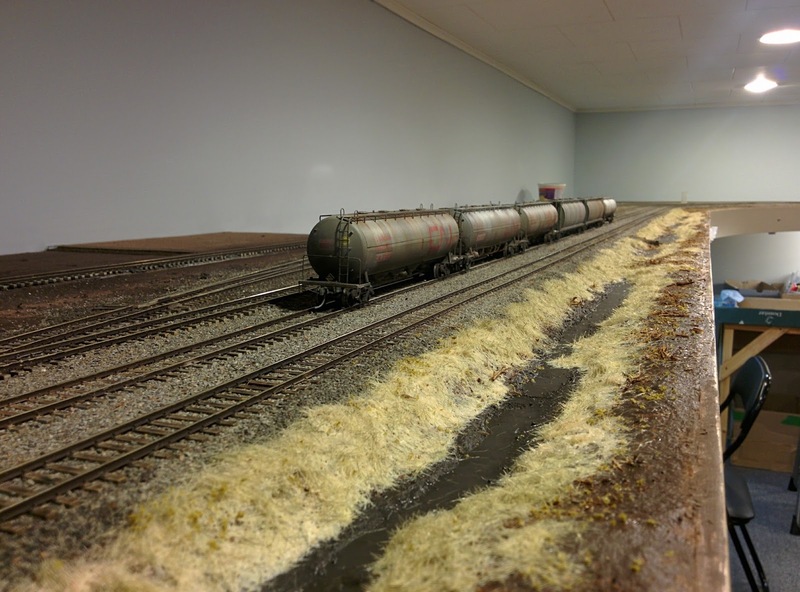 Given it took me about 4 sessions to bring the ballasting up to 90% in less than 8 hours, I consider it a great achievement for myself. Truth to be told, I no longer hate ballasting track. It also means we will be able to run trains from D’Estimauville to Clermont again. The next goals are quite simple and include touching up the ballast job, modelling the roads and grade crossings, then starting to add vegetation and ground cover. 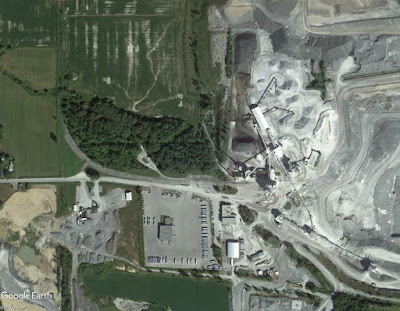 However, the biggest job will be building the cement plant. I brought back the base board home and will soon revise my plans. However, knowing I’m in danger of getting paralyzed by overplanning, I guess I’ll simply go forward as best as I can and address issues on the spot. Most people would consider my plans are more than enough for the job, but it seems my professional background is kicking in. It’s hard setting my mind in such a way I don’t have to plan every detail for workers to do the job. And finally, the last but not the least, I’ve also (re) started working on JMRI Operations to create switchlists. The learning curve is definitely steep but the results are rewarding. As a working example, I’m using the Harlem Station layout to better grasp the software possibilities before implementing it on the club layout. One thing I’ve learned is that you can’t understand the software if you are not building dozens of trains to really understand how cars are routed. Practice makes perfect and this is both true in the real and virtual worlds. JMRI isn’t about slapping the correct ingredients in the correct order, you seriously need to fine tune many things since no layout is identical to the next one and worked examples are nothing but handy templates, not ready to go solutions. As much as I often said model railroading isn’t the sum of technics, the same apply to operation. You need to add a sense of purpose – a soul – into the logic behind the scene. For those interested, you can take a look to my Harlem Station blog for additional information. I’ve particularly explored how historic evidences can feed the operating concept and have a sizeable impact on how you can make JMRI behave in a more prototypical way. Ready for another layout design entry? From time to time, a good design challenge is all that is required to keep one's mind sharp and creative. And my habit to dig up Southern Quebec prototypes kicks in again. Have I said in the past this area is full of hidden gems rarely modelled in scale and generally, when done so, spiced up with too much modeller's license to be palatable? I'm at that point in my life I believe presenting a clinic about prototype selection in a given area would be extremely useful. Or maybe layout critics in magazine instead of glossing over every shortcomings just as we do with other form of arts... So many people are technically proficient in railway modelling but otherwise indecisive or simply clueless about the setting a manageable scope for their project... which is generally a shame. As you know, I'm actually in the process of restoring my 1875 house first floor and this other layout project is based again on what can be done with a 8.5' X 10' spare room with two blind walls - which incidently is a rarity in older houses. 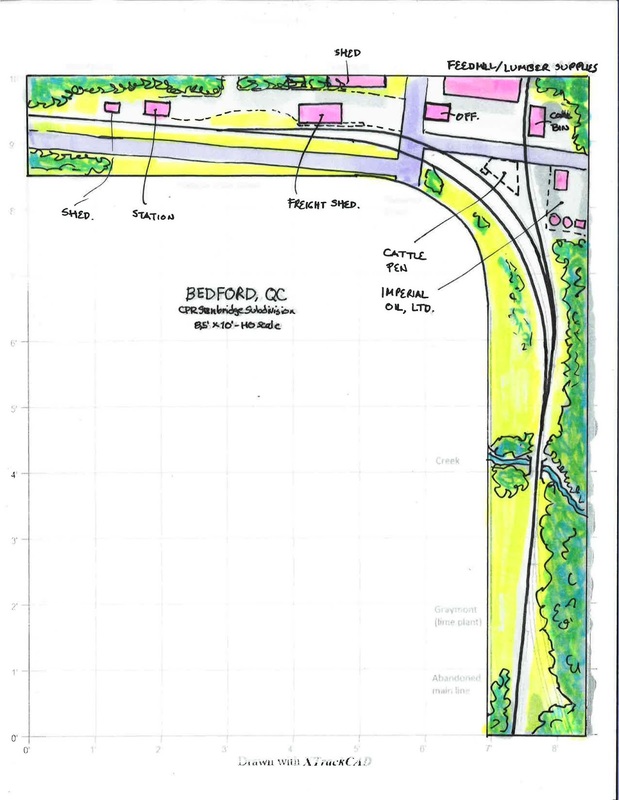 Knowing many great layouts are actually built within very small rooms, I thought experimenting with Stanbridge Subdivision in Bedford would be great since the prototype is nested on a sharp 90 degree curve. Not only the geography fits the space but the type of railway activity too, which is what matters in the end. After carefully surveying key dimensions on Google Earth, I was able to design what I consider a decent layout in a small space with potential for operation lasting from 30-45 minutes depending on the number of car handled, and maybe more. As presented, the layout is all about grain and lime traffic and could be very interesting for people who particularly like covered hoppers in the modern era. 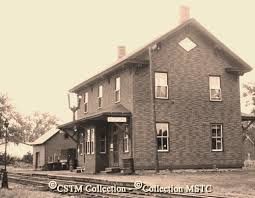 To make a short story, Standbridge Subdivision is an old failed CPR connecting line that linked Farnham (an important division point on CPR Short Line) and Stanbridge where interchange with Central Vermont and diminutive Philipsburg Junction Railway occured. While the original purpose of the line got redundant and unprofitable quickly, the small local communities had enough strong customers to keep the subdivision in service between Farnham and Bedford as a branchline. 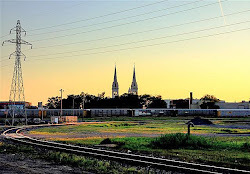 For what matters, we go back in the late 2000s and early 2010s under the infamous Montreal Maine and Atlantic tenure (when that railway was just another cute and colorful rundown line until Lac-Mégantic disaster). At that time, the remaining customers were all located in Bedford. 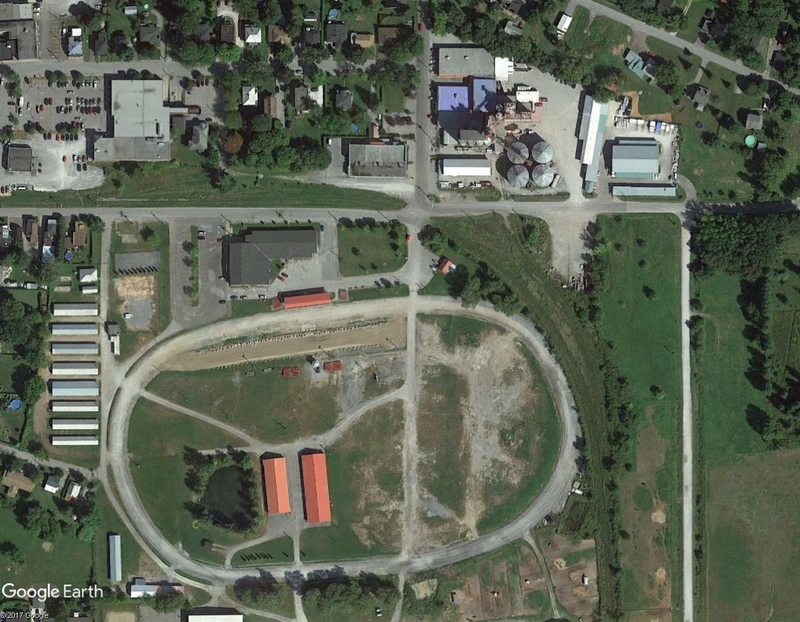 The first one was a mid-sized feed mill and hardware store (Rona Lévesque) and the second one the large Graymont limestone quarry. Operation is based on MMA prototypical practices and trains are shorts (about 3 to 5 cars). I don't have the details on hand, but lime traffic was quite important and all pictures (Google Earth, StreetView, railfan's photos, etc.) show quite a lot of cars in limestone service. Operation would consist in shuffling empties and loads at the quarry and spot occasional grain cars at the feedmill. Railfan and photographer Mike Berry did a great job shooting the last days of this subdivision, particularly when a train was stranded for months after a derailment over faulty track. His work is extremely inspiring. A neat thing about the lime traffic is repurposed grain cars were used to haul it. According to pictures, a few were obviously of Chicago & North Western while others came from ethanol-dedicated corn suppliers. 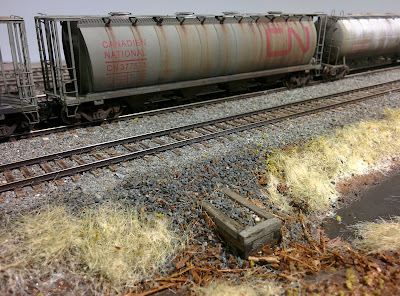 Most were patched and nicely weathered, creating a nice set of side projects for the layout. As it stand, this would be a 100% covered hopper thing. For the layout purpose, I tried to keep things to scale, but cut about half a mile of track between the feedmill and Graymont. If more space is available, I would simply suggest to add mainline run between both customers and maybe extend the layout on the left side and model the neat bridge scene as a way to conceal the layout end and a staging area. The idea would be to add some distance between elements to create a sense of open space. 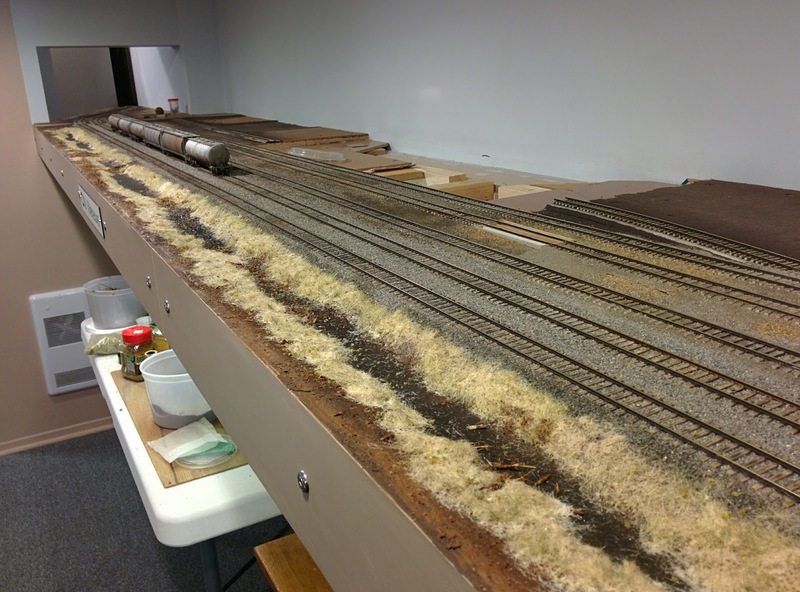 In that regard, the layout wouldn't be very different than Jim NcNab's excellent Grime Lines and most of the mainline could be modelled on a fairly narrow shelf (8" to 12") in a similar fashion than Tom Johnson's INRAIL layout is built. This trick would save both space, time and resources to model. Both man prooved us immersive scenery didn't need to be wide to be effective. Operation wise, you only need one locomotive. To be precise, a GE Dash-8 B38. MMA #8583 was an ex-LMX patched locomotive with a lot of character and Atlas did make one in the correct paint scheme. It would make a neat customizing project. 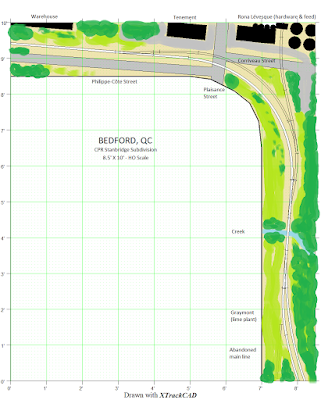 I suspect this layout would be extremely fun to build, particularly because Bedford is a small rural town with a quite a presence (at least, from a modeller's perspective). Another positive aspect of its small size is it could be detailed quite nicely over a long period of time without being overwhelming. Once again, a neat switching layout doesn't need to be a spaghetti bowl to offer variety and interest. Bedford in the Steam Era? Why not! Incidently, people interested in the transition and steam eras would find this prototype very interesting too. 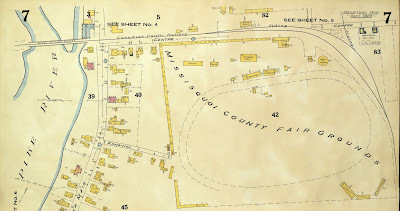 According to a 1928 insurance map, an oil dealer was located on the left side of the feedmill siding. Nested between this siding and the passing track was a wedge-shaped cattle pen and a freight depot was located on the same track near the left turnout and a passenger station was nearby. 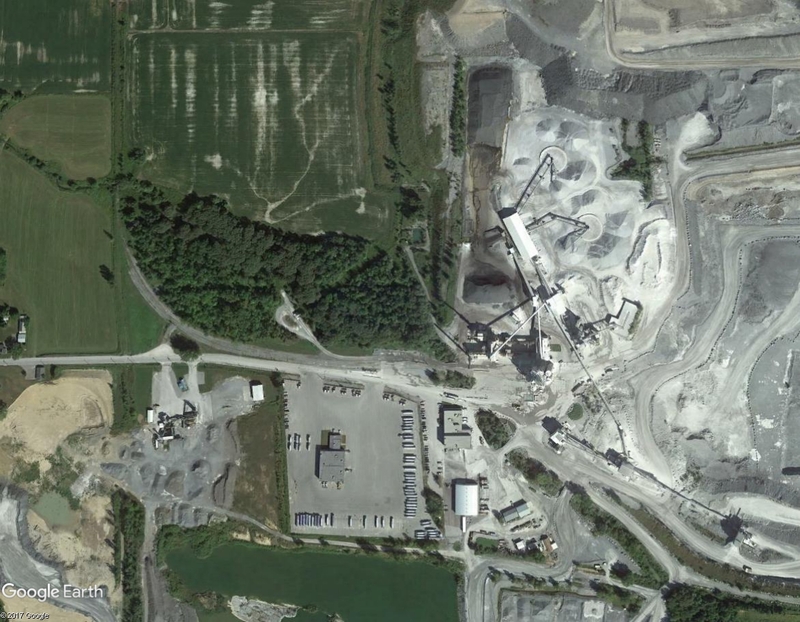 Also, the feedmill received grain shipments, but also dealt with building supplies and had a coal bins. This would bring a total of 7 new car spots and Graymont, which didn't exist until recently, could be removed all together without any significant loss of operation. 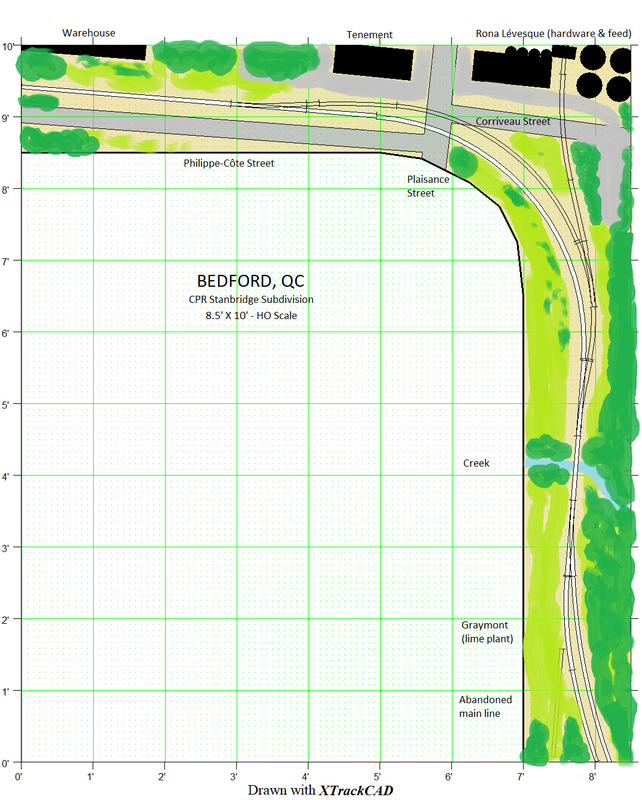 The area between the freight depot and street could be used as a team track too. 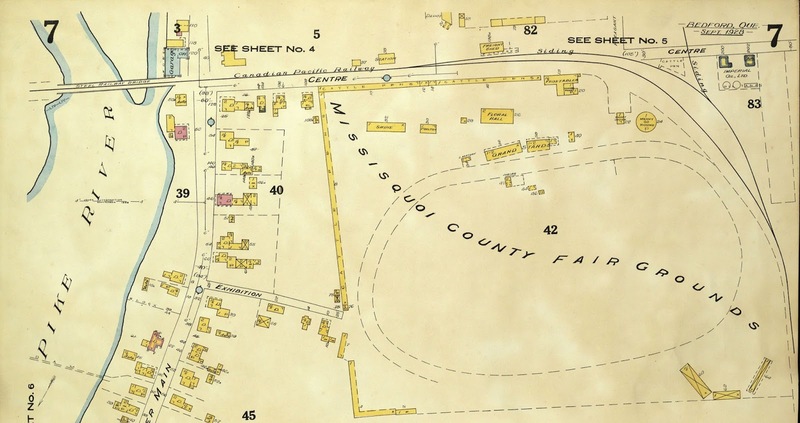 And keep in mind all that trackage was located next to the Missisquoi County Fair Grounds which would probably generate interesting seasonal traffic and extra trains (hay, horse palace car, special tourist trains, etc.). All that with only three turnouts and not that much space required. Operation wise, only a small steamer would be required. One could start with an excellent Bachmann 4-4-0 (the modern one) or 4-6-0 and kitbash them into decent Canadian Pacific steamers or invest in brass or simply wait Rapido release their Icons of Steam roster. Mixed trains would be the norm and I believe the best way to operate the layout would be as a stop enroute to a terminal. On one session, you could operate the train as bound to Stanbridge and the other day replicate the returning train to Farnham. This way, you would get rid of intricate and unprototypical runaround moves. Given the number of spot and the alignment of turnouts, it means some industries can only be switched in one direction. This can be an interesting way to explain why picked up cars moved toward Stanbridge will come back to Farnham since this is their true destination. Once again, it is possible to prove you can have a lot of action and interest in a very little stretch of track.